High-End property developer DNP Holdings Bhd, which could be rebranded into Wing Tai Malaysia in the near future, is poised for a quantum leap in profits. For the year ended June 30 2009, DNP posted a net profit of RM14 million, but DBS Group Research forecast net profit could soar to RM114 million by the 2012 financial year. For the year ending June 2010 and 2011, DBS forecast a net profit of RM51 million and RM78 million respecitively. DNP is 54 per cent owned by Wing Tai Holding Ltd, a Singapore public-listed company which has created a niche reputation as one of the island state's top high-end residential developers. DNP's second largest shareholder is former banker Chua Ma Yu, who owns 2.83 per cent of the company as at end-September last year. The report said DNP has been marketing its KL high-end segment under the umbrella of Wing Tai Asia, to help ride on its parent's strong brand name. "We do not discount the possibility of DNP being rebranded in the near future," Mei Hui Yee, an analyst with DBS wrote in a report initiating coverage on the residential developer with a price target of RM2.60 a share. "We conservatively expect DNP's earnings to leapfrog by 3.7 times over the next three years. If all launches go ahead as planned, there could be a further 40 per cent upside to our earnings estimate," Mei wrote in the report. 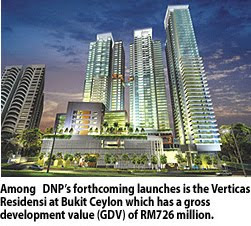 DNP has about RM1.5 billion of upcoming high-end launches around Kuala Lumpur's Golden Triangle over the next few months. Among its forthcoming launch is the Verticas Residensi at Bukit Ceylon, which has a gross development value (GDV) of RM726 million. The project comprises 423 condo units priced at a minimum of RM1.2 million a unit. "We understand 64 per cent of the 70 units opened to registrants have been sold to date (within just one month) despite the price tag and ahead of management's expectations," Mei wrote in the report. DNP is also expected to launch by year-end a high-end condominium project that comprises 25 units priced at RM3.5 million a unit. The condos have a built-up area of between 3,000-3,500 sq ft. It is also expected to launch 197 units of luxury condos just opposite the Petronas Twin Towers by next year. The project is estimated to have a GDV of RM703 million. CIMB Group is eyeing sale-and-leaseback exercise for its properties, said group chief executive Datuk Seri Nazir Tun Razak. "We are engaging a few potential buyers and they are financially, potential investors," he said. According to Nazir, the transactions for all its buildings, especially CIMB branches and some other offices, would be completed by the fourth quarter of this year or the first quarter of 2010. Early this year, the group had signed an agreement with Pelaburan Hartanah Bumiputera Bhd (PHBB) for the sale and leaseback of the new 630,000 sq ft 39-storey Menara Bumiputra Commerce. The group is now the sole tenant of the building, he said. "The transaction with PHBB was worth RM460 million. On top of that, we spent about RM80 million for internal refurbishments," he told reporters after the opening of the building by Yang di-Pertuan Agong Tuanku Mizan Zainal Abidin today. The Menara Bumiputra-Commerce, which cost RM400 million, was constructed by IJM Corp Bhd. It began in October 2004 and was completed early this year. It will serve as the headquarters for commercial banking, franchises of CIMB Group, CIMB Bank and CIMB Islamic. Nazir said the investment banking and capital market arm would be located in Menara CIMB, which was still under construction in Kuala Lumpur Sentral. He said construction was expected to be completed in 2012. Nazir said today also marked the completion of CIMB Group's multi-year branch re-branding exercise. "South-East Asia's largest retail network of 1,150 branches across Malaysia, Indonesia, Singapore and Thailand have now all assumed the CIMB icon, its red and green colours and consistent branch look and feel," he said. Those who are interested in landed property and like condominium facilities should head for the Mah Sing Properties’ booths during the three-day The Star Property Fair 2009, which kicks off at G Hotel and Gurney Plaza in Penang this Friday. 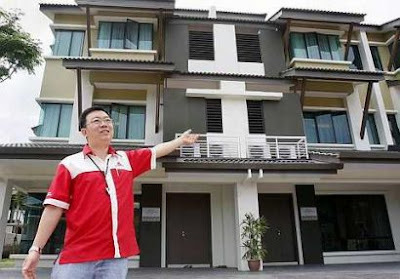 Luxury homes: Tan showing units of the SouthBay Residence comprising three-storey link houses equipped with condo facilities in Batu Maung Penang. The developer will showcase its RM241mil SouthBay Residence project comprising 284 three-storey link houses that come with condo facilities such as a guardhouse, clubhouse and swimming pool in Batu Maung in Penang. Its general manager Tan Hun Beng said the units were selling fast with only some 60 bumiputra lots left for purchase. “We have applied for and conformed with all the requirements needed for the bumiputra lots to be released beginning of next year. “Potential housebuyers who are interested will be placed on the waiting list with some 300 others,” he said, adding that 70% of the units were snapped up within two weeks after the official launching in May this year. Tan said everything that was behind the guardhouse in the gated and guarded landed property was considered private owned, unlike certain landed property where the service roads or drains belong to the government. “In other words, each of the 284 houseowners is actually a shareholder of the property. “Besides, the availability of comprehensive clubhouse facilities and round-the-clock security are also plus points for this project,” he said, adding that each unit was priced from RM900,000 onwards with a built-up area of over 3,000 sq ft.
Construction work started in June and is scheduled for completion by end of next year. The SouthBay Residence comes under the SouthBay project which comprises two other projects — SouthBay Legenda comprising 76 hillside bungalows and SouthBay City, a tourism development comprising hotels, a shopping complex, a themed restaurant, a food court, the Admiral Cheng Ho Memorial Hall and a sculpture garden. Tan said the three projects, located a stone’s throw away from one another, sit on a 35ha piece of land which was bought in June 2007. On the bungalows priced from RM3.5mil onwards, he said the 76 units with built-up areas ranging from 5,000 sq ft to 8,000 sq ft would be open for registration during the three-day fair. “One of the unique features of SouthBay Legenda, comprising three and four storey resort bungalows, is that each unit is fitted with a lift and a private swimming pool,” he said. 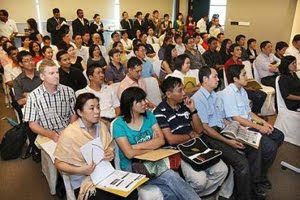 Exhibitors of The Star Property Fair 2009 attending a briefing at G Hotel. The Star Property Fair 2009’s new venues at G Hotel and Gurney Plaza have been welcomed by exhibitors hoping for a bigger crowd. Benar Prima Resources Sdn Bhd sales administration senior manager Lee Phoy Yeong said G Hotel should be a good venue to promote upmarket property as the hotel was linked to Gurney Plaza where the lifestyle section of the fair would be held. “This is our first time at the new venue and we don’t know what the crowd will be like. “The Star Property Fair is a good platform to sell our products,” he said, adding that the company had sold 90% of its Casa Prima lifestyle apartments in Seberang Jaya. The Star Property Fair had been held at the Penang International Sports Arena since its inception in 2003. SP Setia sales and marketing assistant manager Joanne Koay said the company had good expectations for the new venue. “We recorded fairly good sales at last year’s fair,” she said. Monier Sdn Bhd regional sales manager John Tan said this was the first year that the company would be taking part in the Star Property Fair, and expectations were high for the new venue. “We expect G Hotel and Gurney Plaza to attract more medium and higher-end customers who are our target group,” he said. More than 80 participants from about 70 companies recently attended a briefing on the set-up of the fair at the hotel, conducted by Star Publications (M) Bhd advertisement sales account executive Mike Ong. Besides the usual briefing on bookings and deadline to set up and tear down the booths, the exhibitors were given specific details relating to the new venue such as electrical points, security and parking. They were also given an introduction to The Star Property Portal, and taken on a familiarisation tour of the exhibition area.